How Does a Gas Fire Pit Work? A gas fire pit is a decorative structure, primarily for outdoor use and display. Some are designed to look like real fire pits that were commonly used for cooking hundreds of years ago. These types of gas fire pits can still be used for cooking nowadays. They may be made to appear is they are constructed from concrete, brick or stone, and contain coals or logs that burn brightly. However the coals or logs are decorative and the real flame is being produced by natural gas or propane. Smaller indoor models also exist that may appear as if the fire was being produced from a large pot or fountain. These are largely ornamental or conversation pieces that serve no real purpose. 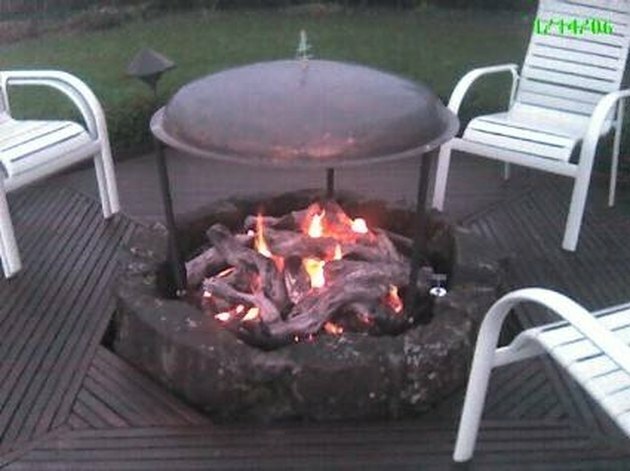 There are many different designs of gas fire pit, but they all work on the same principles. First, there is the housing that contains a gas line from the house or a portable propane tank. The top of the housing is a large concave heat resistant bowl. One or several burners sprout out of the bowl from below. These are attached to the tank underneath, supplying them with combustible gas. The bowl is filled with fake heat resistant logs or coals to break up the shape of the bowl and hide the burners from view. The more decorative bowls might be filled with fine sand, gravel, or river stones for a unique look, though these types of fire pit require mesh covers over the burners to prevent clogging. The pit may come with an ignition switch which, once the gas flow has been turned on, ignites the burners and gives the appearance of a real coal or wood fire. Gas fire pits are hazardous, just as all sources of fire are. There have been many instances where outdoor patios have been burned down by carelessness or improper use of such devices. In most cases, the coals of wood of the fire pit may be scattered if someone trips or falls up against the pit's body. They are made to look solid and part of the surrounding structure, but they are most often not and can be knocked over easily. The coals, superheated by contact with the flames over long periods, ignite anything flammable they touch. Another even more catastrophic scenario is when people fill a fire pits with fine particulate such as sand or gravel, without first ensuring the burner nozzles are covered with a mesh and capable of venting their flames. This is particularly dangerous if the fire pit is used indoors. If one of those nozzles should become clogged, the pressure behind the nozzle will build until whatever is causing the clog is fired out violently in a blast of flammable gas. The blast will create a flare that can potentially reach the roof if used indoors. It will also scatter the contents of the pit, causing burning embers to fly everywhere.